Happy Monday, y’all! I hope you had a great weekend! Mine was the craziest ever, so I’m glad to be facing a new week with fewer responsibilities. 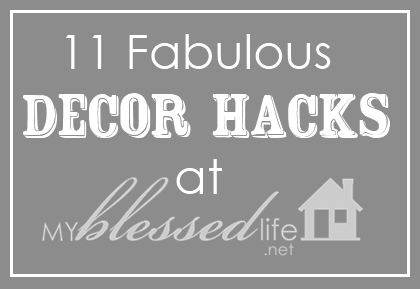 Today, I’m sharing 11 Fabulous Decor Hacks, especially those that are inspiring for renters. 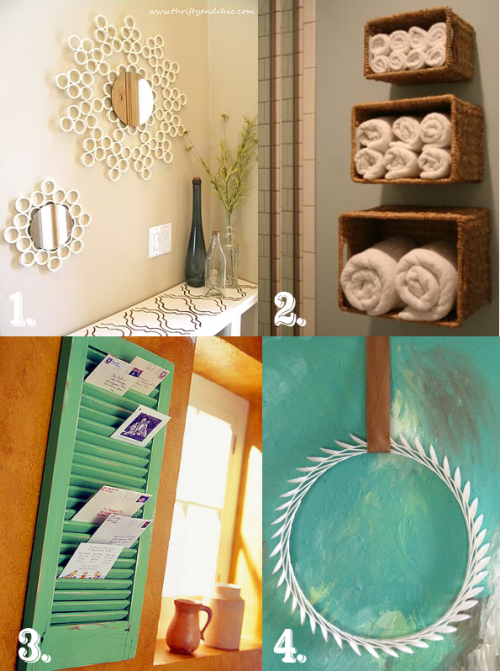 However, these decorating ideas are great whether you rent or own your home. Home decorating can get expensive, so I love ideas to cut costs and corners. Rental spaces don’t always have the best storage solutions, so making the most efficient use of space is also important. My favorite 10 places to shop when decorating on a budget coupled with these decorating hacks and ideas will enable you to decorate your home to look like “you” without costing a fortune! Simply painting a piece of furniture will add personality to your space, but check out the ideas below for creative furniture re-purposing furniture ideas for your home. Many landlords will allow you to change out light fixtures as long as you keep the original fixtures and change them back out when you move. I love unusual light fixtures especially those that give you a lot of bang for your buck. A simple coat of spray paint on a thrift store or yard sale light fixture is often just the upgrade that you need. Below are three of my favorite DIY pendant lights that are perfect for small spaces. Aren’t you inspired? I sure am! There are so many ways to decorate your home beautifully and efficiently for minimal cost. The creative wheels in my brain are turning because I’m gearing up to tackle my boys’ room…and yes, for as little expense as possible. Do you have a favorite decor hack? I would love for you to share your fave in the comments! Have a beautiful Monday!! And get your decorating on! I have partnered with Apartment Guide as an Official Apartment Guide Decor Blogger! As an official blogger, I am sharing articles and ideas for exploring your space, city and style. Whether you’re living, looking or moving, Apartment Guide offers how to tips for making the most of a space on Moving Today and the Apartment Guide Blog. Learn where to find budget-friendly furniture for small spaces and figure out your personal decorating style! If you’re ready for a whole new space or are looking to move, Apartment Guide has the photos, floor plans, features and tips to help you find the perfect apartment community. Share your best moving, decorating or organizational tip for your home on Twitter using #unlockAG and be entered for a chance to win prizes with the Apartment Guide Unlock and Reveal Sweepstakes. Click here to learn more! Apartment Guide and owner Consumer Source, Inc. have partnered with bloggers like me as Official Apartment Guide Bloggers. As part of this program, I have received compensation. They have not told me what to purchase or what to say about the products used, and believe that consumers and bloggers are free to form their own opinions and share them in their own words. Consumer Source’s policies align with WOMMA Ethics Code, FTC guidelines and social media engagement recommendations. NO PURCHASE NECESSARY. Sweepstakes ends @ 9:01 PM ET on 5/15/12. Must be a US legal resident of the 50 US states or DC and 18 years of age or older. Sweepstakes subject to full Official Rules available at www.unlockwithapartmentguide.com. Void where prohibited. This is great. I’m currently going to make some changes to my kitchen with inexpensive ways. I plan to use decals, paint and change the hardware. Ever since my husband and I made a play kitchen for our nieces I’m eager to try another furniture repurpose. The laundry station is inspiring, I’m thinking something like that would work well for my sons toys. Thanks for sharing this Myra! I love it! Can you tell us how you go about repainting a piece? Do you strip it first? Sand it? Or just paint right over the old finish? I’ve always been hesitant to buy furniture that I could refinish because I didn’t want to deal with the chemical agents. 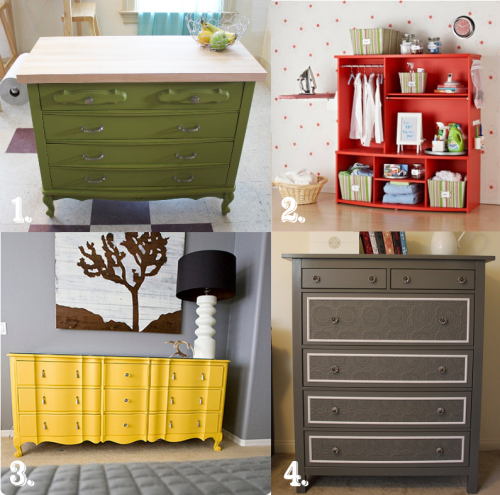 Great round up Myra 🙂 I saw that yellow dresser earlier in the week and LOVE the color.